9 reasons you should buy a modular? A modular home is built in a factory and then carried in sections by special trucks to a building site where it is put together by a local builder. Modular Homes look like any other home. Cutting edge building technology allows modular manufacturers to build any style of home from a simple 1,000 square foot ranch to a highly customized 6,000 square foot contemporary. Modular Homes are not the same as “Manufactured Homes”. Modular Homes are constructed to the same state and local building codes and are subject to the same zoning regulations as site-built homes. In contrast, Manufactured Homes comply with the Federal Construction Safety Standards Act (HUD/CODE), which requires homes to be constructed on a non-removable steel chassis. Many communities have restrictions on where manufactured homes can be located. Modular Homes generally give greater value for your money. When you add up all the labor, material and time savings inherent in the modular building process, you will find that the price of a modular home is generally lower than a site built home of comparable size. Plus you will keep saving money year after year, as your energy efficient home keeps your heating and cooling bills low. 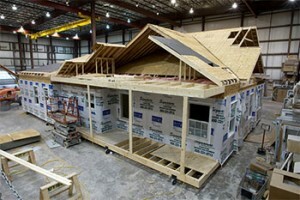 Modular homes are built in factories, and benefit from the assembly line production process. The factories buy huge quantities of lumber, sheet rock, carpet, paint, etc., they pay much less for each and can have large quantities delivered at one time. Labor is used with maximum efficiency, with skilled craftsman moving between workstations on the factory floor. Modular homes are built in a modern controlled environment, and they are precision engineered for a lifetime of trouble-free structural durability. Quality control is maintained by constant inspection throughout the construction process. To insure a safe and secure trip to your property, modular homes are built especially well, using high quality materials. For example, there is typically 20% to 30% more lumber used in framing your home and most factories GLUE as well as nail or screw the components of the home together. The home owner’s worst nightmare – the job’s half finished and your builder tells you he’s way over budget and needs more money or else he’ll quit. Factory-built houses come at a guaranteed price, without cost overruns. Everyone knows someone who’s had this problem – just don’t let it happen to you. You don’t want an unfinished house slowly rotting away in the rain. When you buy modular, you get your finished house product ready for installation. Maybe you like your jeans pre-washed, but you don’t want your house to come that way! A site-built house open to the rain can cause your wood to warp or swell, problems you’ll never get rid of in a lifetime of ownership. Modular houses are built in controlled environments under the factory roof and are shipped in weather-proofed wrapping. Often times you don’t really know what quality you’re getting with a site-built house. Modular homes are thoroughly checked out before they leave the factories. A quality control process provides 100% assurance that your home has been inspected for code compliance and workmanship. In-plant inspectors as well as independent inspection agencies inspect the home on behalf of your state & local government. On the average, a home consisting of two sections will be built in the factory within a couple of weeks. Once your home is placed on its foundation, final completion takes two or three weeks. This schedule allows you to move more quickly, and knowing when you’re new home will be ready helps you plan your move better. You can learn more about the site work phase on this page. As site preparation work differs for each property, you should contact your local builder for a more exact schedule for your home. Repair bills can really add up. Modular homes are built in a modern controlled environment using high quality materials. They are precision engineered for a lifetime of trouble-free structural durability. A well-built house is a home that is easier and less costly to maintain. Additional factory insulation and precision building techniques make the modular house a super efficient energy conservation home. And of course this cost saving lasts every year you’re living in the house. And it helps your resale value too! Modular home manufacturers have many different design plans for you to choose from. You can even design your own house and the factory engineers will work with your builder to bring it to a reality. Modular homes are becoming more popular and there are an increasing number of financial institutions eager to write new loans. You can even apply for a mortgage on our web site. A word should be said about modular home pricing. It is not possible to give you specific prices since there is a great variance in site, transportation, labor, quality, and other costs from market to market and even site to site. Here are the 3 biggest myths and the truth that debunks them. Truth: Although modulars are often a solid bargin, you should not expect an unrealistic discount to other types of building. When you purchase your new modular home you are choosing unmatchable quality and speedy completion. If a modest savings accompanies those features you win in every way. As in any business you will find as many pricing policies as you will builder/dealers. Be alert. Sometimes there are genuinely good buys, but watch out if it sounds too good to be true. Truth: Not necessarily so. Of course small modular homes are a great value. Generally they are priced competitively and are far superior in quality. However, as the home size increases the modular gains in cost efficiency. After all, the savings on a modular is on materials and labor. It logically follows that the bigger the house, the more materials and labor, the greater the savings. Your Modular Center affiliated builder with speak to you in detail about pricing your home. Truth: The myth couldn’t be farther from the truth. The modular home is as financible as its site builder sister. Some banks even specialize in modular lending. Check out our finance section for details on some banks that we recommend. Today’s modular homes are computer engineered to meet all national, state & local building standards. With hundreds of stock plans to start with, and the ability to computer generate unlimited variations, the design of your “dream home” is only limited to your imagination. 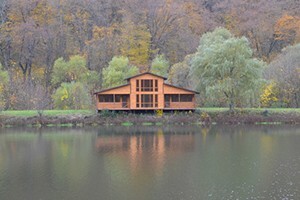 As with traditional building methods a modular home starts with its framework. Modular homes typically use 20% to 30% more material in the framing to insure a safe and secure trip to its destination. Most factories GLUE as well as nail or screw the components of the home together for a more solid assembly. Most modular homes are now built in a modern controlled environment using high quality materials. They are precision engineered for a lifetime of trouble-free structural durability. Quality control is maintained by constant inspection throughout the construction process. In starting a modular home, great detail is given to the layout & strength of the floor, since this is what will carry the weight of the rest of the home. After the floor joist & sub-flooring are in place, the wall panels are put in place. The wall panels will already have the sheet rock on the inside. The electric & plumbing can then be installed. After the wiring & piping is done, all nooks, crannies & crevices are sealed with insulation and the wall cavity is insulated. Next comes the exterior sheathing, roofing & finished siding. Somewhere in the midst of all this the windows & doors, bath & kitchen fixtures, carpets, cabinets, and heating units are installed. The completed product is then wrapped with a protective material for shipping, loaded on trailers and sent on it’s way to you. Of course this is an oversimplified description of the real workmanship and quality materials that go into each of these homes, but it gives you a basic idea of the technological advances in the modular home industry. Site work is scheduled to be completed by the time your home is ready for shipment from the factory. The excavation must be cleared to the exact depth required for the type of foundation you have selected. Next, the footings must be placed and the foundation walls erected. Exact measurements are one of the most important factors at this stage. Care must also be taken at this time to insure that provisions are made for the installation of utilities such as electric, water and waste disposal. Schedules must be made to accommodate the time needed by each of the trades to complete their preliminary work. When the big day arrives, the modules are delivered by trailer and placed on your foundation as pictured above. Once your home is placed on the foundation the additional finish work is usually completed in 2-3 weeks. Better informed people make better buying decisions. Buying land can seem very complicated; it’s not something we do every day. And what you don’t know CAN hurt you. Make sure you get all the facts. Don’t miss the forest for the trees! Appreciate what the land has to offer you. People with a deep respect for the enduring qualities of land are quick to point out that land is a tangible asset. It’s there, and it’ll always be there. It can be seen, touched, smelled and appreciated. People buy real estate for many reasons. A vacation-type property is perfect for those who desire personal enjoyment or relaxation from their purchase. For example, it might be situated near ski areas or lakes. On the other hand, primary home buyers need to consider other factors, such as proximity to good schools, nice neighborhoods or employment opportunities. When buying land, evaluate your main purchase carefully to make sure it’s the right time or reason to buy. Property very close to a popular vacation area or a major city is expensive. A property’s location will determine its price, and may be a factor in how much property you can actually afford to purchase. You might want to consider purchasing property further away from a major city, ski area or lake in order to maximize your investment dollars. If you’re looking for a home site, consider both potential values AND privacy requirements. While one or two wooded acres will provide privacy, a better buy might be a larger area of land. For example, your cost per acre on 10 acres will probably be much less than the cost per acre for just a single acre or two. However, finding 10 acres on a lake may be next to impossible. Make sure your property will support what you want to do with it! Want waterfront property? Buy now! Waterfront properties are quickly becoming the finest things money can’t buy. Riverfront and lakefront properties are becoming difficult, if not impossible, to find. Even properties with small ponds, brooks and streams are becoming less abundant, and therefore the demand for desirable parcels is increasing quickly. With a surveyed parcel, you’ll have greater assurance that the acreage will be exactly what you contracted for, and the boundary lines are properly shown on the survey map. Without a survey, you can only guess at the number of acres and the exact boundary lines. All Heavenly Homes properties have current, staked surveys. Financing on unimproved land is sometimes difficult to find, especially on property that’s located out-of-state. It’s not unusual for banks to require a down payment as much as 50 percent of the total purchase price. Heavenly Homes offers 80 percent financing on all our land to qualified applicants or we can help you find affordable local banking financing. Is the title to the property clear? The title should be free of “liens, easements and encumbrances.” Look for property on which ‘clear title’ is guaranteed with a Warranty Deed. Heavenly Homes sells every parcel or lot with a warranty deed. What are the current taxes on the property? We all wish taxes were lower, especially when we’re buying property for the long run. Low taxes help reduce carrying costs. Taxes usually relate to services provided by the town, as well as the tax structure of the state. Make sure you understand what the taxes are. See property tax section of Lot Information Statement provided by Heavenly Homes. What services are available in the area? The answer to this question should directly relate to your use for the property. Be sure you know all services provided by local government or public utilities. Obtain estimates of costs for wells, septic systems and utility extensions. Heavenly Homes properties come with a Lot Information Statement to inform you of this important information. What are the zoning and/or deed restrictions on this property? Each state, county and town follow different regulations regarding subdivision and zoning. It’s VERY important that you understand what uses are permitted or not permitted on any given property, in order for you to decide which parcels meet your requirements for use. Heavenly Homes is knowledgeable about local zoning and can assist you in this area. Is Title Insurance available on this property? Title Insurance is a guarantee that, in the event of title disputes, the insurance company will attempt to correct the problem, and if unable to, they will defend your right to title. All Heavenly Homes properties are available with title insurance. Discuss the availability of owner financing. Many banks are reluctant to finance land, particularly if it’s located out-of-state. Some real estate companies can arrange financing with the owner, or with a local bank who is familiar with the property. Appreciate the importance of a professional land company staff. Ask for a recent property survey. Always insist on reasonable access to your property. Always try to obtain a warranty deed. Always ask whether title insurance is available. Buy a property without adequate access. Even if you never intend to use the property,you’ll need reasonable access if you decide to sell it. Buy a property on an ‘agreement for deed,’ if you intend to build before paying for the property. If disaster strikes and foreclosure is necessary, the building becomes a part of the property, and will be forfeited at time of foreclosure. Agree to forfeit your deposit in the event you cannot obtain your own financing. Land financing can be difficult to obtain, particularly on a parcel outside your home state. Agree to purchase property which is deemed uninsurable. The value of your property is directly proportionate to the rights you hold in that property. Buy a property unless the seller or agent can provide you with a recent survey and show you the property corners. Adjustable Rate Mortgage: a broad term for a mortgage with rate and terms that can change. The “ARM” has become commonplace, with allowable ranges as to time intervals, percentage of increase or decrease, and total increases or decrease likely to change as market conditions change. Amortization Schedule: a schedule that shows how much principal and interest are due at specific intervals, and the unpaid balance of the mortgage after each payment. Broker: one who acts as an intermediary between parties at a transaction. Easement: a non-possessory property interest that one person has in land owned by another, entitling the holder of the interest to limited use or enjoyment of the other’s land. Earnest Money: the cash deposit -including initial and additional deposits -paid by the prospective buyer or real property as evidence of good-faith intention to complete the transaction. Encumbrance: something that affects or limits title to a property, such as restrictions, mortgages, leases, etc. Escrow: provides that a third party, acting for both buyer and seller, handles disbursement of funds for specific purposes. Grantee: the person who receives a conveyance of real property from a grantor. Grantor: the person transferring title, or an interest in real property, to a grantee. Improved land: land with roads, utilities and structures, as opposed to ‘raw land,’ which has no physical improvements. Lien: a claim by one person or institution on the property of another as security for a debt. Mill: one-tenth of one cent. Some states use a mill rate to compute property taxes and sales taxes. Origination fee: a fee charged by a lender to prepare loan documents, make credit checks, inspect and/or appraise a piece of real estate. Generally, the fee constitutes a percentage of the face value of the loan. Plat Map: a map of a town, section or subdivision indicating the location and boundaries of individual properties. Prorate: to divide or distribute proportionately. With the exception of principal payments on a mortgage, most real estate expenses such as rent, insurance (which is frequently prepaid for several years of coverage) and the like are paid in advance. Survey: the process by which boundaries are measured and land areas determined; the on-site measurement of lot lines, dimensions and positions of houses in a lot, including the determination of any existing encroachments, easements and compliance with setback requirements. Title: documentary evidence of ownership, detailing the history of property ownership and transfers. Title can be bought, inherited, or obtained via foreclosure of a mortgage. Title Insurance: a comprehensive indemnity contract under which a title insurance company warrants to make good any loss arising through defects in title to real estate, or any liens or encumbrances upon the property. Variable Rate Mortgage: see “Adjustable Rate Mortgage” above. Warranty Deed: a deed in which the grantor fully warrants good clear title to the premises; also called a General Warranty Deed. Waterfront Property: real estate abutting on a body of water such as a canal, lake, river or ocean. Zoning: the regulation of structures and uses of property within designated districts or zones.